The following families have genealogy eBooks on this page: Allen, Bethune, Brockman & Dean, Byrd, Chipman, Davison, Mifflin, Morris, Pond, Potter, Thrasher, Tinker, Turnley, Van Hoosear, Waldron, and Woodworth. Welcome to Bookshelf 7 at Hawkeyes Trading Post! 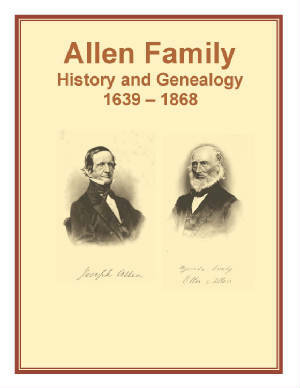 Allen Family History and Genealogy or Genealogical Sketches of the Allen Family of Medfield. PDF eBook English 4.52 MB. 1869. James and Anna Allen arrived in the American Colonies in 1639. The statistical information provided references their descendants for the period 1639 up until 1868. Also, there are two Golden Wedding Celebrations with written accounts for Ellis and Lucy Allen, and Gershom and Abigail (nee Allen) Adams. A source of abundant information for the Allen family genealogist! Price $6.95 USD. Brockman and Dean Family History and Genealogy or A Genealogy of the Brockman and Dean Families. PDF eBook English 5.72 MB. 1905. 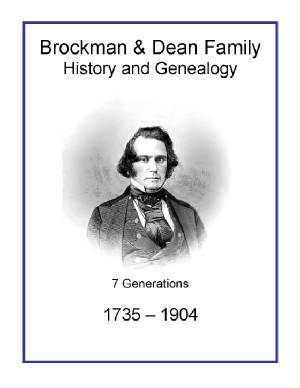 This publication contains 7 generations of Brockman and Dean family members from 1735 to 1904 with short biographies, dates, and family lore! A 15 page alphabetical index provides reference to over 150 family members. A source of centuries old genealogy that may not be found elsewhere! Price $6.95 USD. Chipman Family History and Genealogy or Chipmans in Maine. PDF eBook English 1.35 MB. 1897. The legend of the Chipman family name finds it’s origin as far back as 1085 as “de Chipenham” according to this publication. 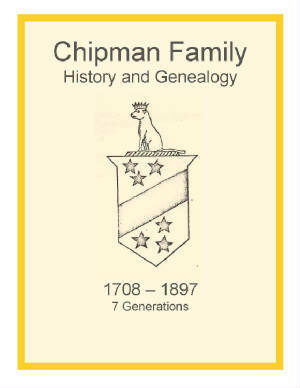 Chipman kindred are compiled from the year 1708 up until 1897 with 7 generations of vital records provided for this period of time. Only 38 pages in length, and packed full of information, this is a real treasure for any member of the Chipman family! Price $6.95 USD. 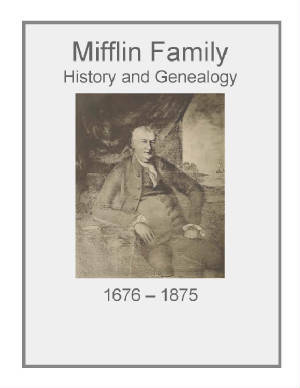 Mifflin Family History and Genealogy or Charles Mifflin M.D. with an Account of his Ancestors and Ancestral Connections. PDF eBook English 3.13 MB. 1876. This publication is written in storybook form with many fascinating details about various Mifflin households from the year 1676 up until the year 1875. Many short biographies, family legends, and nearly 200 years of compiled family records are located among these pages. Extraordinary information for anyone of the Mifflin family interested in family genealogy! Price $6.95 USD. 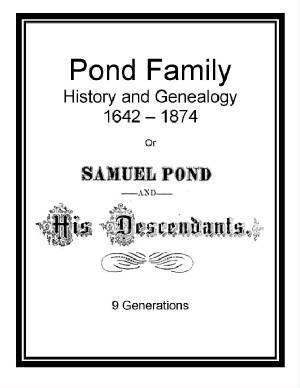 Pond Family History and Genealogy or A genealogical Record of Samuel Pond. PDF eBook English 8.23 MB. 1875. Music and poetry written by Pond family members over 130 years ago, short biographies, travel stories from the 1800s, 9 generations of Pond ancestors, and an index of over 900 family descendants are contained in this extraordinary eBook! Documentation spans the years from 1642 up to 1874! This is a treasure of information for Pond family members! Price $6.95 USD. 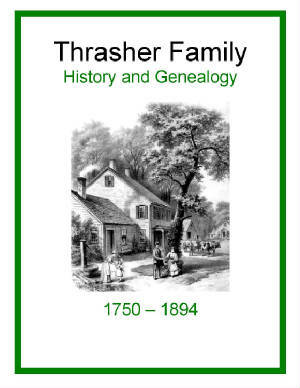 Thrasher Family History and Genealogy or A History of the Thrasher Family. PDF eBook English 3.61 MB. 1895. Painstakingly hand typed on an old Remington typewriter this publication contains personal letters sent to the author during the 1800s. Short biographies, and an auto-biography, accompany over 140 years of compiled family records extending from 1750 up to 1894! A source of abundant information for the family genealogist! Price $6.95 USD. 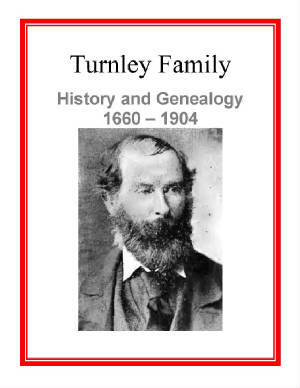 Turnley Family History and Genealogy. PDF eBook English 13.8 MB. 1905. This eBook provides numerous rare ancestral photographs, details on the history of the family Coat of Arms, and contains a map referencing the family homestead of yesteryear. Documentation of family members from 1660 to 1904 provides over 240 years of significant information with dates! A must have for any Turnley family member! Price $6.95 USD. 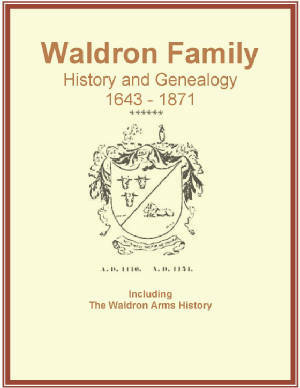 Waldron Family History and Genealogy or Coat of Arms of the Waldron Family. PDF eBook English 489 KB. 1897. This eBook discusses the history of the Waldron family name, which legend provides was 900 years ago in the year 1110. Fascinating detail of the battle that originated the family Coat of Arms is chronicled! This short and concise publication of 19 pages documents the family genealogy stretching from 1643 to 1871, and references La Monte Raymond Waldron among the ancestors listed. Price $6.95 USD. 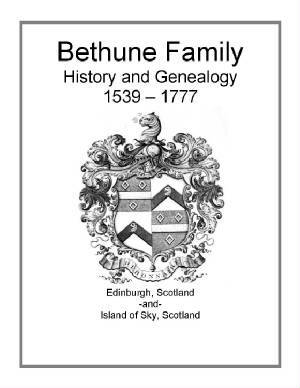 Bethune Family History and Genealogy or A Historical and Genealogical account of the Bethunes of the Island of Sky (Scotland). PDF eBook English 1.99 MB. 1893. Small biographies, and many delightful descriptions of the Scottish countryside, and its history, are contained in this eBook. The Bethune lineage is provided with vital dates that stretch from the year 1539 up to the year 1777. Those with the Bethune surname may well find their distant ancestor’s roots among those forefathers listed! A magnificent reference for any family member! Price $6.95 USD. 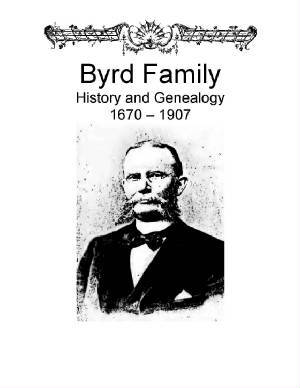 Byrd Family History and Genealogy or History and Genealogy of the Byrd Family from early 1700 [who] first settled at Muddy Creek Virginia. PDF eBook English 5.04 MB. 1908. The history begins with Nathaniel and Naomi (nee Watson) Byrd who first settled at Muddy Creek, Accomack County, Virginia. Their descendants are listed with vital dates from the year 1670 up until the year 1907. Short biographies are written about various Byrd households, which provide a great source of information on one of America’s long standing Colonial families! Price $6.95 USD. 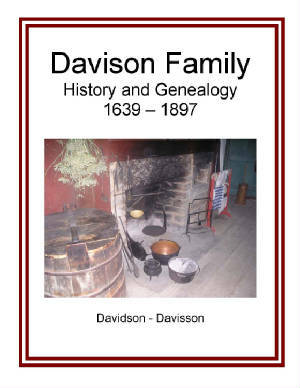 Davison Family History and Genealogy or Genealogical Record of the Davison, Davidson, Davisson Family of New England. PDF eBook English 8.01 MB. 1899. The family legend regarding the surname origin stretches back nearly 500 years to 1520 in the Highlands of Scotland. Documentation of family members from 1639 to 1897 provides significant information and vital genealogical dates! Price $6.95 USD. 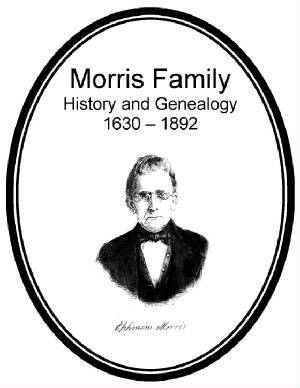 Morris Family History and Genealogy or Ephraim and Pamela Morris ancestors and descendants. PDF eBook English 12.6 MB. 1894. Many rare ancestor photographs, pictures of tombstones, and maps to reference homesteads are compiled in this excellent book! Stretching from the year 1630 up to 1892 there are 24 pages of indexed names with over 2000 people listed! Price $6.95 USD. Potter Family History and Genealogy or Genealogy of the family of John and Wait Potter. PDF eBook English 1.00 MB. 1885. 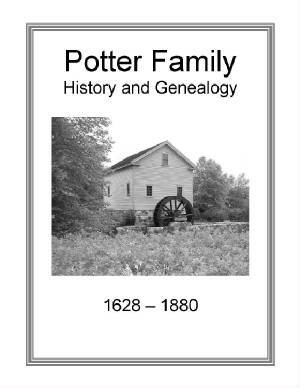 This publication is a very well organized, formatted printing, which contains 10 generations of Potter family forefathers. The statistical information on family descendants covers the period from 1628 to the year 1880. Although less than 15 pages in length it is a rich source of abundant information for the family genealogist! Price $6.95 USD. 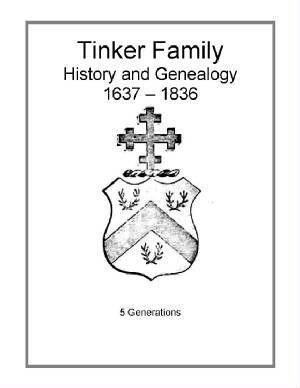 Tinker Family History and Genealogy or The Ancestors of Silas Tinker in America. PDF eBook English 664 KB. 1889. This publication references Thomas Tinker, a Mayflower passenger, as one of the earliest of the kindred with the Tinker surname in America. There are 5 generations of Tinker family members listed with compiled vital dates extending from 1637 to 1836. Although only 13 pages in length, this eBook contains an abundance of information for anyone with this surname! Price $6.95 USD. 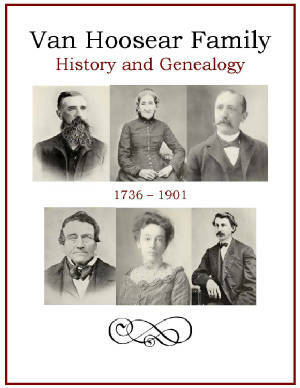 Van Hoosear Family History and Genealogy or Descendants of Rinear Van Hoosear. PDF eBook English 7.1 MB 1902. A fantastic history of the Van Hoosear family in the very beginnings of colonial America. The family legend of the origins from Holland are detailed, the forefathers who fought with the patriots, and the story of an uncanny death by a lightning strike of a descendant which occurred hundreds of years ago is retold in detail. Ancestral poetry, numerous rare photographs, 7 generations of descendants, and a 12 page index with over 1,200 names are included! Essential dates of vital information range from the year 1736 up to 1901! Compelling family history! Price $6.95 USD. 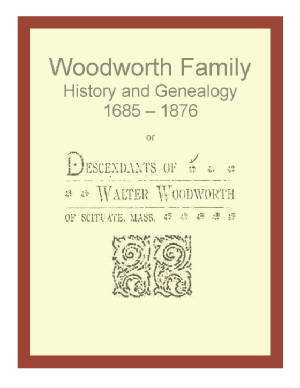 Woodworth Family History and Genealogy or Descendants of Walter Woodworth of Scituate. PDF eBook English 7.20 MB. 1898. The ink was fading rapidly on the pages of this rare publication, which was saved from the ravages of time! Adjustment of contrast and brightness will be necessary to read the contents. However, the documentation which can be extracted may provide an abundance of new and unique information for the Woodworth family genealogist! Stretching from the year 1685 up to 1876 there are 17 pages of indexed names with over 1800 descendants listed! We provide this publication because of the possibility of rare genealogical information it may contain although it was deteriorating in its original binding. Price $6.95 USD.